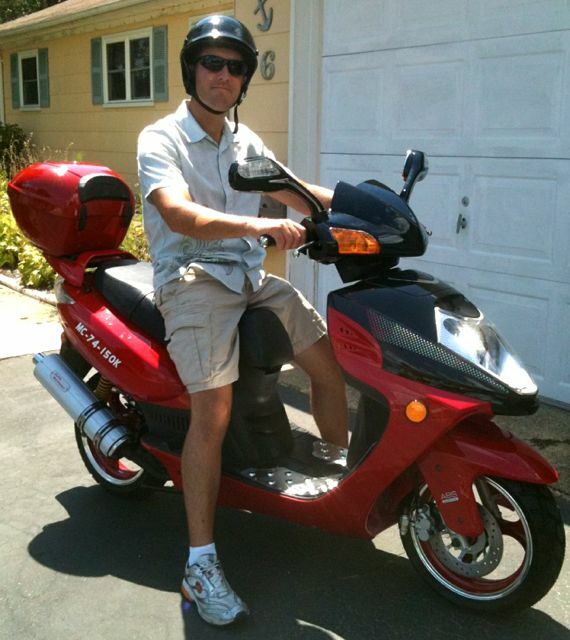 My brother Tom got a scooter. I'm very excited for him! He is very practical and was looking for supplemental transportation for daily commuting. Since he lives in New Jersey, he'll only be riding part of the year. So, he chose a very basic inexpensive brand. As part of the shipping process, the scooter was not fully assembled. He needed to finish the assembly which included items such as the front wheel, speedometer, front breaks, handle bars and top case. He also needed to charge the battery by adding the acid solution. The company he bought if from told him it would take about 30 minutes to assemble the scooter. Two days later he got it all together, and took it out for a test ride. While at first it seems unfathomable that a company would require this much "some assembly required". I really think it had a good benefit. Tom is now fully intimate with most of the parts of his scooter. This is some really beneficial knowledge which will come in handy when he needs to do maintenance. Many people pay 2-4 times as much for a scooter, and then have no idea how to do some of the most basic maintenance, such as changing the engine oil, gearbox oil, or replacing a tire. So maybe having to put it together himself, while at first seemed cumbersome, could end up being a valuable experience. I don't know much about scooters, but this guy is handsome!